Searching for a call contact center solution for your business? Look no further than Nectar Desk. It includes a complete call center software solution complete with computer telephony integration, integrated voice response technology, voicemail recording, automatic call distribution, call transfers, extensions, call monitoring as well as analytics dashboards to help you better understand your data and manage your call center accordingly. Get a call center software solution that is much less expensive than our major competitors but still comes complete with all of the features necessary to run a complete customer service operation from the cloud. View alternative comparisons to see how our offering stacks up against other providers such as TalkDesk, Five9 and Aircall. 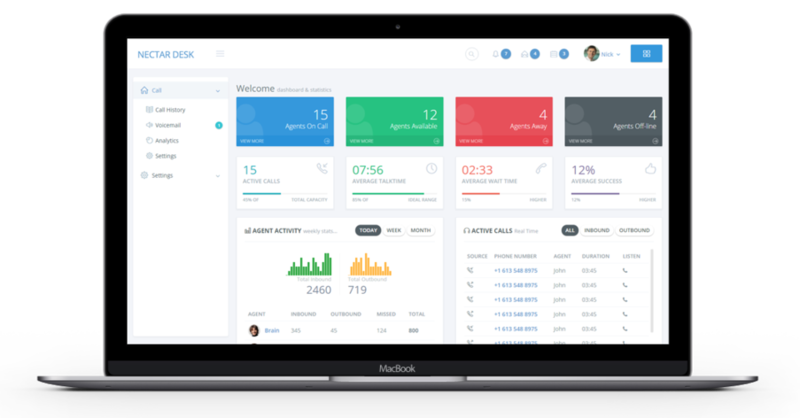 Use our CRM capabilities to integrate with popular CRM tools such as Zendesk, Active Campaign, Teamwork Desk and Pipedrive. Perform key actions automatically such as creating contacts and deals and logging calls directly from the Nectar Desk platform. Get started with Nectar Desk today. Sign up for a free trial. No credit card required. We fulfill our mission by delivering the most simple, intelligent Cloud-Based Phone System Solution in the world.dware. 24/7 Phone and Live Chat Support. You don’t need to pay extra to get world class support. Our knowledgeable support team is available to assist you whenever you need them. We have built Nectar Desk with a simple belief in mind – don’t charge clients before they try and are happy with the product, Make it very simple to use, and keep all customer interaction under one roof. We invite you to give Nectar Desk a chance to show you how our Cloud Calling software can change the way your clients are treated. No matter how large or small your team is, be it one agent or over one hundred you can take advantage of all the features in our solution. Phone + SMS + Chat + Email. We offer Advanced trial accounts completely Free for 14 days. accounts completely Free for 7 days.